FORMAT: ALL IN GLORIOUS, FRESH 35MM!! Who are you and what's your association with cinema 21? "I've been a projectionist at Cinema 21 for 5 years now -- a projectionist in general since 1998. But I was a weekly fixture at Cinema 21 long before I worked there. It's always been my favorite movie theater. It's more than my home away from home; it's my church. Why you? Why a Hitchcock festival? I've actually been bugging my boss, Tom, for a while to do a Hitchcock festival. I originally wanted to do it on Hitch's birthday in August two years ago. But sometimes these things roll very slowly. With the success of the noir series back in March (another thing I had to pester him into), I think Tom finally saw that we could do a tribute to Hitchcock and he wouldn't lose his shirt. Plus it just seemed like the timing couldn't be better. 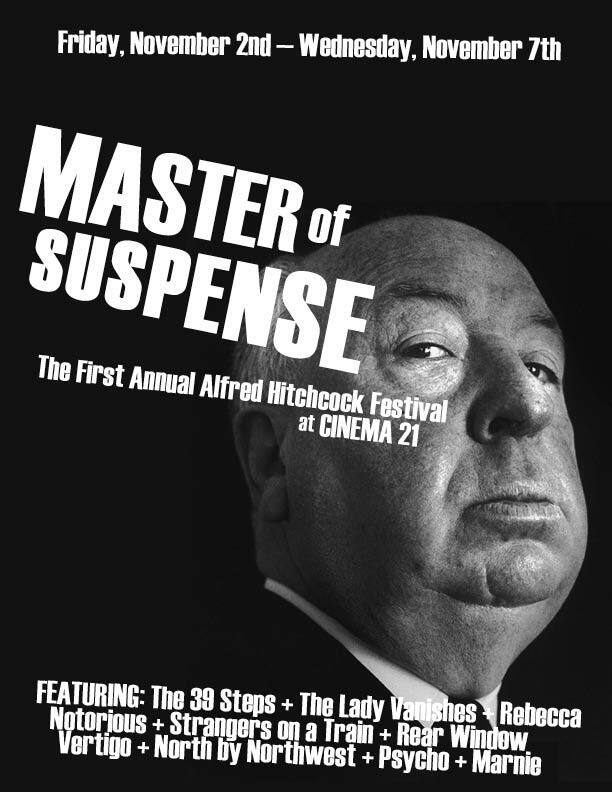 The Sight & Sound pronouncement, the new movies, Hitchcock is just in the air right now. For personal and sentimental reasons, though, one of the greatest film-going experiences I ever had was seeing Rear Window for the first time as a young adult at Cinema 21. I was so completely blown away I returned the very next night to watch it again, just to be sure it wasn't a one night stand, that the movie was actually THAT GOOD. So I wanted to bring that feeling back to the theater, if only for selfish reasons. In an era in which projection is increasingly digital, What is involved in putting together a 35mm film festival? It's fairly difficult. First of all, there's the availability and condition of the existing prints. Film is a delicate medium. Some films are just plain unavailable. (For instance, we couldn't program The Birds because it's currently making the rounds as part of Universal's 100th anniversary tour. I really wanted Lifeboat but we were told there wasn't a print in circulation right now.) Some prints are in poor condition. In fact, when we got our print of Vertigo, we looked at it and very quickly realized that the print had seen better days. We immediately asked Universal if there was a better print available and we dished out the extra money to get it here. Which leads right into Part Two: it can be very expensive to do a festival of 35mm films. We actually sought out private sponsorship to make this festival possible, mostly for the shipping costs of these prints. But we felt like we had to show these films ON FILM, the way The Master intended. When we did the noir series, Tom was on the fence about going film or going digital. (Let's make this clear: I was not on the fence. I wanted film very badly.) Tom has to watch the prices of everything, so I don't blame him for being tempted by the lower costs of digital versions, especially where older films are concerned because the shipping costs are drastically reduced. Additionally, he's so busy that he doesn't watch the films in the theater as often as he'd probably like to and therefore is a bit removed sometimes from the power of celluloid. So when we came up with a list of the films we wanted to program, we found prints where we could, but then we compromised on a few titles (the ones we couldn't get 35mm prints) by showing the blu-ray versions. The very first film of the series was The Killers, of which we managed to get a brand new 35mm print. Tom and I watched it and afterwards he turned to me and vowed, right then and there, that we would always get 35mm prints for these types of festivals in the future. He was no longer on the fence. The print looked THAT amazing. He was a believer again! When judging these prints up against a digital copy (a comparison which I've done on the big screen), I think the difference is unmistakable. Film is most assuredly the superior format. It not only looks better, it actually FEELS better, too. It's a whole other experience. And by the way, for this festival we've managed to get stunning brand new prints of The Lady Vanishes, Rear Window, Vertigo, North by Northwest, Psycho, and Marnie. If the restored Dial M for Murder makes a theatrical run, can we hope to see it at Cinema 21? Will it be digital or (I hope!) a restored film version? We showed Dial M in 3D the summer before last on film. It was spectacular! Tom and I wanted to program it for this year's festival, but decided it was too soon. So I feel very confident we'll have it in next year's festival. However, I noticed that the Film Forum in New York played the new digital version in 3D over the summer and I wonder how it looked. If it's possible to make the 3D effect better digitally than in the celluloid version, I think we might give it a try. We have a new digital projector and when we showed Pina in 3D, it looked incredible. So... maybe? But, like you, I also hope for a restored film version. How wonderful! I hope this will be a regular event.